Thanks to a dirty, overweight dog, yours truly, THE aging and out-of-shape Michael, has once again sustained a back injury (pulled muscle) and am at home on painkillers and muscle relaxers instead of at work injuring my back the smart way. Thus, I am burning PTL (paid time off) on my own dime and using my own insurance rather than billing the good folks at workman's comp. I woke up with my back on fire, which means I did something yesterday, and the only thing I could think of was picking up this fat canine and hauling him to the bath tub. Shiloh does not like baths, so he does not rush headlong into getting clean, thus I have to drag or carry the beast, and now that he's in his elder, crippled condition he has been putting on the pounds (Just like his daddy.....groan), which is probably how I hurt myself. You never know you did it WHEN you do it, thus I have been rudely awakened to the injury today and will have to undergo another two weeks of light duty and physical therapy. Oh.....joy. OK, so it's the next day, I'm still here recuperating, and the weather has taken a turn for the wet. It HAS been wonderfully warm these past several weeks, but now another one of those damn Canadian cold fronts has passed thru, sucking all the moisture out of the warm air here and dumping it while dropping the temperatures to the just cold enough to be miserable zone. According to the weather widget here on my desktop, it's supposed to freeze tomorrow night, so I'll have to go out and turn on that light bulb hanging with the water pump, as well as drag some of our more delicate plants inside. I think maybe Winter is sort of here. OUR version of it, at least. There's been a lot of hue and cry about the mounting civilian casualties that the Palestinians are suffering during the incursion by Israel into Gaza. Yes, those civilians that the brave and mighty warriors of God called Hamas are hiding amongst. Yep, those brave boys who began this mess by firing rockets into Israel and refusing to cease even as the Israelis came in to put a stop to it. The same militant terrorists who can't ever seem to do wrong in the eyes of the international community no matter what they do to Israelis while stating in no uncertain terms they wish to kill as many of them as they possibly can, down to the last man, woman and child. But of course, we're supposed to forget all that and condemn Israel for their "disproportional" response to being attacked. 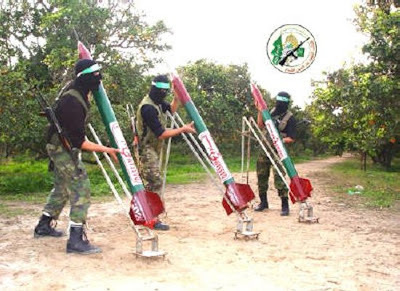 I know, many will complain that these unguided rockets rarely hit anything of consequence, and the actual death toll due to these attacks is miniscule in comparison, but Hamas knows this. The real value of these rocket attacks is that they provoke terror on the Israeli side, and they have been all along hoping to provoke Israel into responded with force so that they can use their predictable use of overwhelming force against them for propaganda purposes. Well, as usual, it's working; more civilians die so that Hamas can scream and yell about Israeli aggression. The bread is being buttered on BOTH sides, my friends. Look, I have just about had my fill of Israel and it's entitled behavior over the decades, and I would cut off all this support first chance I got, especially in response to their illegal settlements and continuing oppression of Palestinians. But a spade is a spade and Hamas has no justification for it's actions. If the Palestinian people want to be free from danger, then perhaps it's about time for them to stop harboring these killers and then maybe they would not suffer the consequences for it. There is just no way that Israel can hit back at these cowards without hurting the so-called innocents so long as the "innocents" are used as human shields, which is really the despicable act being perpetrated here. We need to end this thing once and for all, forcing Israel to make the necessary concessions in return for a Palestinian homeland that is NOT full of crazy people constantly shooting at them. Obama has the chance...maybe he can make a difference where no one has before. This entry was posted on Tuesday, January 13, 2009 at Tuesday, January 13, 2009 . You can follow any responses to this entry through the comments feed . first, sorry about the back! but at least the pooch must SMELL good now! Yoga, The Michael, Yoga - the answer to many many injuries - TRUTH - I mean I broke mine when younger but it is TERRIFIC as long as I do yoga a couple of times a week. If I don't, then the pain is RIGHT back. The US siding with Israel has nothing to do with a "moral" choice. It's strictly business. We have a larger financial investment in Israel (with HUGE interest being paid for money we loan them) and therefore it's in our interest to side with them over the Palestinians. It's all a mess and I certain have nothing constructive to say about it. Though I agree with selkie - there is no fixing it - especially not by us - the infidels. Got to agree with the Selkie about yoga. I work 11 plus hours a day on a bloody computer, and then some time having "fun" at home.y back has bever given me a problem at age 49, and I put it down to my Mom teaching me yoga from a young age. Now, when I get a bit slumped or stiff, I get those Sun Salutations going. It really helps. Altjough possibly not in the first eina stages of putting the spine out! Maybe when you're a bit better. On the Gaza question - well yes, I do the knee-jerk eff the Israeli occupation as well, but you make a good point about Hamas.Bloody cowards. All of which is of course no excuse for wholesale slaughter. Well, what is, I ask you with real tears in my eyes? Religion seems to me just an excuse for fighting over the important thing to these dudes - land and resources. These wars are only going to become worse as we run out of both, I'm afraid. Anyway, I think the religion thing is a bit of a blind -it'd be language, or skin colour, or what sect of Atheism the state subscribed to, if it weren't for the obvious scapegoat of religion. I'm pretty much over the whole mideast thing. If they can't learn to play together, then the hell with it. Let them fight. Blaming the poor doggie dog for your aching back .... tsk, tsk, tsk. I wondered where you went! Is this the blog you're sticking with? Sorry about your back Michael. That dog sure is purty. I'm lucky. All my morbidly obese animals are cats, under 20 lbs. But...add them all up and I've got 65 lbs of cat in my house. Dern furbags.